Call 952-226-5900 for competitive pricing. Our line of consumables are OEM (original equipment manufacturer). We offer a limited option of tested and warrantied remanufactured toners. 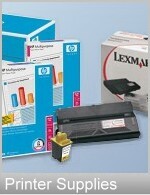 At CRS we consider the supplies for your printer are more than a simple toner or black ribbon. Quality in is quality out! Copyright © 2019 COMBINED RESOURCE SYSTEMS LLC. Minneapolis-St.Paul, Minnesota. Privacy. Disclaimer.